Welcome to SIP CE Online. SIP designed these online educational courses to keep you current in medical malpractice and patient safety-related issues that will help meet your licensure renewal needs. All SIP courses are created by or in collaboration with experts in the legal, medical and patient safety fields. As an added service, SIP submits on the 1st and 15th of each month, continuing education course completions on behalf of professionals with valid Florida licenses to CE Broker. Course completions less than 30 days before your licensure renewal due date should be self-reported to CE Broker to ensure timely reporting of credits and uninterrupted licensure renewal. To view answers to common questions or get technical requirements in order to take our courses, CLICK HERE. For a guide on how to enroll in our courses, CLICK HERE. 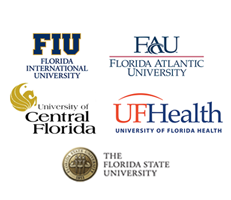 From the images on the right, please select your university or select "All Other Healthcare Providers" if you are not associated with one of these universities. ALL of our continuing education courses are FREE to participating members of FBOG Self-Insurance Programs with an active, registered, member institution email address! When you register your active institutional email address for a course, a non-transferable coupon code will be sent directly to that institutional email address. Simply be sure to enter the coupon code into the shopping cart prior to checkout. With a coupon code, the course is free. There is no need to purchase a course with a credit card. You will not be sent an invoice. Coupon codes are non-transferable and can only be sent to an active, registered, institutional email account. Registering with other email addresses such as Gmail, AOL, or other email service providers will require payment of course fees. By requesting a coupon, you are agreeing that you are an active member of an FBOG Self-Insurance Program and, therefore, entitled and authorized to take the requested course for free. You are also agreeing not to redistribute, sell, or otherwise transfer your rights to this course. If you are not an active member of an FBOG Self-Insurance Program and, therefore, unauthorized to request or use a coupon, and you take a course using a coupon or you request a coupon to take a course, we reserve all legal rights to pursue collection of a course fee in an amount we deem appropriate. For assistance, please contact SIPHELP@ad.ufl.edu.